I got tired of my foot flopping around in the footwell so I fabricated this support pedal. Use .080" aluminum sheet stock to make the pedal and 1 or 2 self tapping screws to attach it to the kick panel. You'll need to drill through the kick panel into the metal of the footwell side panel. Cut and stick 2 strips of 3M Non-Skid material on the surface of the pedal. This mod will leave 1 or 2 holes in the kick panel but the support you derive when cornering should override that drawback. I moved mine to where the OD switch is located and moved the OD switch to the shift knob. I screwed it next to the little vent flap on the cross member. You can just see the pigtail coming out of the firewall and curving up to the right past the vent. I have to use my hand to push it but I hardly ever drive the car at night anymore and the dead pedal is still worth the inconvenience. Do you have a dead pedal John? I like the idea of a dead pedal and I hate the location of the dimmer switch. It seems like a bad idea to have your left foot below the pedals because it is hard to get them back into position in a hurry. Could you relocate the dimmer switch to the upper portion of the deal pedal? That would seem like an ideal spot. Yes. Mine is wood and attached to the dip switch bracket. My foot is not below the pedals but on the same plane as them. I've been thinking about incorporating the dimmer switch into the top part of the pedal but it isn't a priority. I really disliked the placement of the high beam switch in my BJ8 and wanted a dead pedal so I designed one and printed it on my 3D printer using a carbon-fiber infused plastic. It is very solid, uses the factory screw holes for the dimmer switch to mount the pedal, and relocates the high-beam switch to the top of the pedal where it is still convenient but out of the way. I think it turned out really well. If you would be interested in having one of these, PM me. That looks great, Glenn! 3D printing has fascinating potential, and it's interesting to see a Healey part made that way. Thanks. It is a real game changer when you can envision something, create a virtual model, and then click a button and presto (5 hours later in this case) you have the exact thing you imagined. I am making a few other Healey improvements that I will share when they are complete. If anyone has ideas let me know. Very nice! Simple solution moving the switch up out of the area of the dead pedal. Note - it requires the BJ8 dip switch and mounting bracket & wouldn't fit earlier cars as-is. 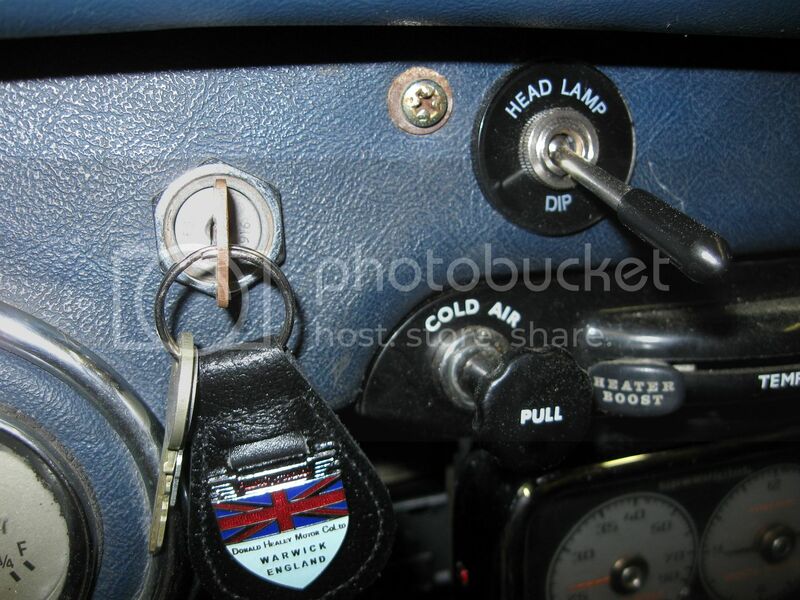 My well used and hard pressed dead pedal, it's a must in any vintage racing Healey. Nice job, Glenn. Both Functional and attractive. Good design and execution. Thanks for the note. I will have to study some other cars to come up with solutions for them. You said: "Note - it requires the BJ8 dip switch and mounting bracket & wouldn't fit earlier cars as-is"
The BN2 - BJ7 switch is 140-900; the BJ8 is 542-130. Last edited by steveg; 01-20-2017 at 12:12 PM.